Excuse Me! 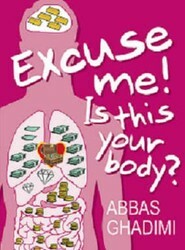 is This Your Body? Publisher: Tagman Press, an Imprint of Tagman Worldwide Ltd.
Tells us that to take full control of our health and avoid painful physical bankruptcy we must apply to our bodies the same rigorous care that we apply to safeguarding our own personal wealth.